HEXUS exclusively shared Raja Koduri's resignation memo, addressed to fellow AMD employees, and in the same article we mused about Koduri's options – back in November 2017. As the HEXUS editor expected, Koduri was confirmed as an Intel exec just a day or so later. That was a long time ago in tech, but some might still be wondering what prompted Koduri's decision during his 40 day break in India. Financial blog Barron's might have the answer, as it has just published an interview it held with Koduri during which he was asked several interesting questions about his move. From the interview it seems that Koduri asked himself an important question about what he wanted to do, how he could best apply his knowledge and skills, during the next 10 years. Only one company checked all the boxes with regard to core technologies, assets, and people that Koduri sought to "do some beautiful, amazing things," with the deluge of data from the growth in computing, social media, mobile, IoT and so on – Intel was the only choice. They next interesting topic covered by Barron's is how Koduri successfully headhunted Jim Keller for Intel within a couple of months of accepting employment there. Koduri said he managed to communicate his excitement about the possibilities availble at Intel over the next 10 years, and so Keller gave up his position at Tesla to help Koduri marshal Intel's 20,000-plus design engineering team. Of the above 20,000 folk, Koduri revealed that he has a 4,500 strong team working on Intel's future integrated and discrete graphics projects. Koduri emphasised the importance of balance in this design team – between hardware and software expertise. Excitedly, the Intel graphics chief explained "What I'm doing is helping them figure out how to build products that scale up from the low power, mobile domain up to petaflops—the big data center GPUs. 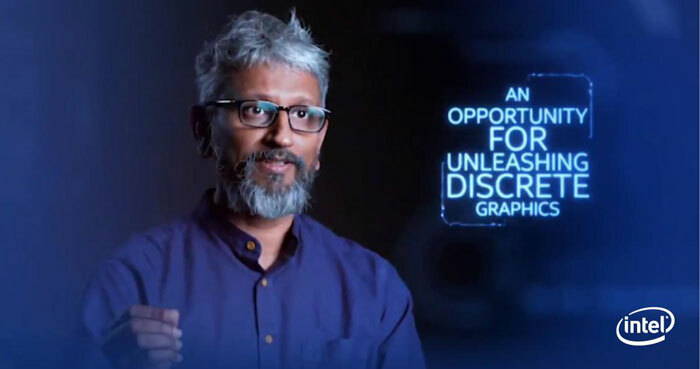 Both internally and externally, there's a lot of excitement from our customers, from enthusiasts, from the market about our entry into discrete graphics in 2020." In related news Intel Graphics has been teasing a new control panel that will launch shortly (sometime this month). If you head on over to this Tweet you can see a short video which shows some of the control panel UI. In response to user enquiries Intel has confirmed that you won't need an 'account' or to log in to use this fancy new CPL. Perhaps 20th March is the day that this new control panel will appear, to tie in with Intel's 'Join the Odyssey' event at GDC19. Created an unsustainable carcass of a GPU and walked away. Hopefully the next carcass he creates will be better. Raja kinda reminds of chris grayling tbh. I hope he doesn't hurt intel too much. How much work do big names like him and Jim actually put in compared to the dozens of engineers working under them at this stage in their careers? Like, did Jim actually place a single transistor for Ryzen or is he just a guiding figurehead for the team? Regardless, I'm slightly surprised Intel still wanted Raja after the abysmal state he left Radeon in… it's a bit like Manchester United deciding to hire the DCFC manager the year they got relegated. Is he AMD's cover up mission?